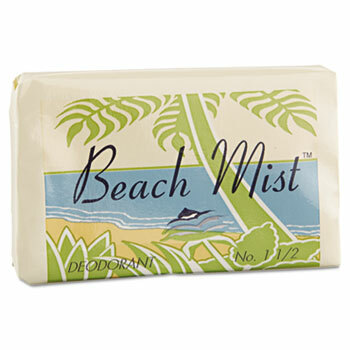 Graced by a pleasant mild scent, the smooth foamy feel of Beach Mist provides a gentle soothing touch to the skin. Consisting of 100% vegetable base (palm) fine bar soaps. The attractive looking wrapper theme conveys the idea of being at a tranquil shoreline resort easily found along the seas, lakes and rivers. 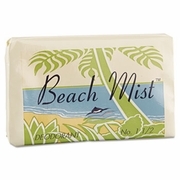 After a day full of rest or action on the beach, Beach Mist invites the guest to take an invigorating and refreshing shower or wash.
500 1-1/2oz bars per case.